It very nearly turned into a pearsauce fail, as I overfilled a gigantic pot with pared pears and then discovered that even my presumably strong triathlon arms could not stir effectively all the way to the bottom and the smell of scorching alerted the nose to Trouble. At which point, sweating and fighting with the mountain of pears, I very nearly gave up and abandoned ship (er, kitchen). The weather had gotten cool just before school started, but this past weekend was hot and humid, and being stuck inside in a fog of steam is not the best way to celebrate a sticky late-summer day. But I persevered. And learned my lesson: haste makes waste. Transferred fruit to smaller pot. Cooked up smaller batches of sauce, and eventually canned what you see above: two canners full of tasty sauce. Add in the two canners of grape juice put up the previous evening, and count me totally done for the season. As soon as the lids started popping, I banished the canner back to the basement. There's still a touch of room in one freezer for small batches of preserves should inspiration strike. 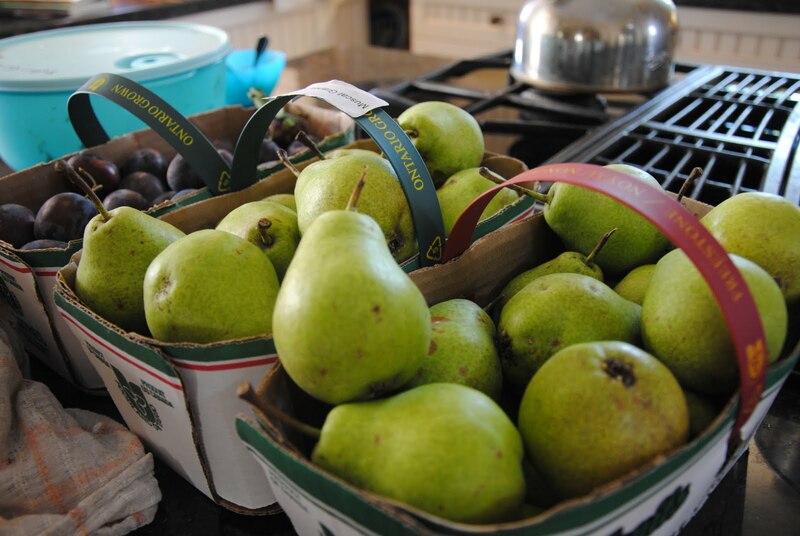 Funny thing is, at the end of the day, I still had two baskets of not-quite-ripe pears sitting on the counter. And so yesterday I made something different for the kids' school lunches this week. Grease a 9x13-inch baking dish. Cream together 2/3 cup softened butter and 2/3 cup sugar. Add 1 and 1/2 cups whole wheat flour and 1/2 tsp vanilla, and continue to beat until combined. Then stir in 1 and 1/3 cups whole oats. Press into pan, and bake at 350 for 20 minutes. Meanwhile, mix together 2 cups of plain whole-fat yogurt, 1 cup of sugar, 2 eggs, and 1 tsp vanilla. Pour over baked crust (I didn't bother to let the crust cool, just pulled it out of the oven after 20 minutes, and poured the custard over top). On top of the custard, arrange 6 cups of fruit. I used thinly sliced pears, and stewed some plums that were going soft in the fridge, and added those, too. Sprinkle the fruit with sugar and cinnamon, and pop the pan back in the oven, still at 350, for 45-50 minutes, or until the custard is relatively firm. It won't be as firm in the middle, but should get firmer upon cooling. Cool on rack, then transfer, covered, to fridge, and cool for another 45 minutes before cutting into bars. Keep the bars stored in the fridge (mine are still in the pan, in fact). It makes a big pan of bars that taste much like a fruit custard pie. The kids were excited to take something other than a cookie to school, though this treat is a bit messier and requires a fork. Here's hoping the forks return. While in food-mode, I must pass on this recipe for Quinoa-Bulgar-Spelt Salad, also adapted from Simply in Season. I ate the leftovers for breakfast yesterday, after my long run, and it felt like I was fully nourishing my body. On a side note, our family has decided to "go vegetarian" for a month, so I am on the look-out for more recipes like this (not that the kids ate a bite, I must confess; we took it to our neighbourhood street party, where they downed hot dogs and hamburgers and desserts, and guzzled pop! Odd that none of them tried mom's quinoa salad offering ...). I plan to blog more about "going vegetarian" soon. Your recipe suggestions are welcome! Start with 3 cups of uncooked grains/legumes in any combination. I used 1 cup of quinoa, 1 cup of bulgar, and one cup of spelt. (I plan to try the recipe with lentils or black beans or even leftover brown rice, too). Cook the grains/legumes according to package directions. Meanwhile, in a large bowl combine a variety of chopped seasonal veggies and herbs, in the amount of roughly 4-5 cups. I used thinly sliced red onion, chopped tomatoes, cucumbers, red pepper, zucchini, and carrots, along with a bunch of stemmed and chopped fresh cilantro and fresh basil. Combine cooked grains/legumes with veggies, and pour over top a dressing made with the juice of 1 lemon + 2 limes, plus 1/4 cup of olive oil, plus salt and pepper to taste. 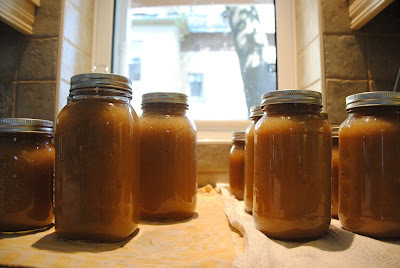 I also added 1 tbsp of cider vinegar. You could use all vinegar and no lemon/lime juice. Or just lemons, or just limes. Or throw in some feta--that would be grand! Whatever you've got on hand. Because that's the kind of salad this is. Expansive. Accepting.